Right now, 12 different intelligences exist within you! Harness their power and you'll suddenly learn at lightning speed! The truths of life are given to those who know how to listen, for only the listeners have stilled their ego enough to turn it off and put their attention elsewhere, acknowledging that they do not know all but that they need to listen in order to learn more. Discover your 12 different intelligences that enhance your ability to learn — FAST! Click Here to ORDER MegaLearning for a special limited-time discount! Yes! I want to double my learning speed and memory PLUS be able to read and comprehend many times faster than I can today. 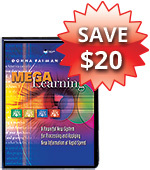 Please send me Donna Faiman Cercone’s audio program MegaLearning - including 7 CDs, PDF Workbook, 20 Color Gel Sheets, and Bonus CD - for just $139.95, which is $20 OFF the regular program price.